With Christmas now less than a month away (and now that we're back from our lovely jaunt to Vancouver), it's high time we launch into another fun filled, exciting edition of my annual vintage holiday season shopping guide. I always put a lot of thought into what theme to bestow on each year's post and this time around was no exception. Ultimately though it was various experiences in my life throughout 2015 that prompted the theme for this year's, as I had/am having some particularly delightful experiences with animals and pets this year. Most folks love at least a few types of animals - if not the whole vast kingdom - and a huge number of us are adoring, responsible pet owners, and in both cases, are frequently fans of sporting and/or filling our homes with animal related items. I'm a giant animal lover and proud pet mama myself, so this is by far one of my favourite Vintage Holiday Shopping Guides that I've penned to date. The items featured here are fun, classic, sometimes whimsical, always delightful choices that are bound to find favour with gift recipients of all ages. Though not all of the products that were included in past editions of the Vintage Holiday Gift Guide are still available for sale, the general suggestions in those posts still ring true and before delving in to 2015's list of animal themed/related products, I thought that you you might enjoy checking out past versions of this annual festive shopping guide, too. Animal themed items have been popular for centuries and were especially beloved during the mid-twentieth century decades that so many of us hold near and dear. In addition, oodles of vintage reproduction, pinup fashion, and vintage inspired companies produce animal themed and related items, plus there are lots of brands that release classic looking pet products and accessories, so with this absolute wealth of animal related goodies at the ready it was a joy to put together this year's delightful Vintage Holiday Shopping Guide. Cuddle up with Fido, Fluffy, or Polly and have a blast with the following selection of 25 fun, festive, vintage, vintage reproduction, vintage appropriate, and just plain adorable animal and pet related products that just about anyone would be delighted to find sitting there for them in their stocking, under the tree, or waiting to be unwrapped for Hanukkah, Yule, Kwanza or any other festive occasion. 1. The hugely beloved Australian brand Erstwilder makes some of the cutest animal themed jewelry on the face of the planet and their seasonal offerings, like this wildly adorable Senor Santa Hat Brooch, are no exception there. I bet you'd be hard pressed to find a vintage/pinup/rockabilly fashionista who wouldn't flip if they saw an Erstwilder brooch greeting them on Christmas morn! $34.95 USD for this particular owl brooch from Estwilder. 2. Jazz up any aquarium living pet's domain with a hit of holiday season cheer when you place this charming Top Fin Christmas Tree Holiday Ornament in there with them. $7.99 from Petsmart (who also have a festive gingerbread house version available for the same price, too). 3. Any horse owner, rider, or fan is bound to enjoy this newly released look at the engaging, fascinating history of the mighty horse, one of the most influential and important animals in the course of human development. The Horse: The Epic History of Our Noble Companion by Wendy Williams, is available for $15.29 from Amazon. 4. Available in over 200 (seriously!) different fabrics, these handmade small pet tents are a stylish, fabulous way to give your guinea pig or hedgehog a new place to play. $20.00 from Henry's Hedgehog Haven. 5. Stylish, cute and cinch to partner with a wide array of vintage, pinup, rockabilly, goth, and contemporary outfits, this adorable Black & White Leatherette Cat Crossbody Purse is sure to delight any kitty fashion fan! #42.00 from Unique Vintage. 6. Sweet as the day is long and ideal for the holiday season, this elegant miniature Christmas flower crown of red berries and green leaves is an ideal way to let your rabbit get in on the festive fun, too. $12.00 from Lalapin Homemade. 7. Bursting with old school charm and appeal, these elegant hand painted brass bird earrings will look sensational teamed with all sorts of vintage, pinup and rockabilly looks. Available in various colour choices, $18.00 from Gleeful Peacock (who have very kindly offered my readers free shipping on all orders at their site when you use the coupon code Vintage15 at checkout). 8. Fabulous for many sizes of cats and smaller dogs, this glamorous light blue vinyl and clear rhinestone c. 1950s - 1960s pet collar would be a fabulous way to share in the wearing of holiday season bling with your pet this year. $23.86 (at the time of writing) from The Gatsby Gals. 10. These Have a Holly Jolly Christmas Guinea Pigs greeting cards are officially off-the-charts adorable! $5.00 per card from My Zoetrope (whose entire product line is equally darling!). 11. Whimsy and classic style both abound in this smile inducingly awesome extra long acrylic dachshund scarf, which comes in at 70 inches long and would work well as a gift for ladies and gents alike. $14.95 from Wireless. 12. Austin Powers fans are sure to flip over this seriously cool Shark With Frickin' Laser Pointer. You just know Dr. Evil will be stocking up on them to give as gifts this year. :D $12.99 from Think Geek. 13. For the beauty product loving, pet owning folks on your list comes Pawdicure Polish Pens, which are filled with animal safe, water based, non-toxic, odourless nail polish designed for use on dog claws. They're available in 13 different colours and retail for $7.95 each from Warren London. 14. Timeless aged brass stars in this adorable old school style handmade goldfish pendant necklace, that would be a terrific gift idea for any aquarium owning vintage fashionista on your list. (On sale at the time of writing for) $23.00 from Unique Vintage. 15. Vintage compacts are something that deserve a place in any old school fashionista fan's wardrobe. Whether used as intended, as a decor piece (such as on a vanity or dresser top), or as the beautiful collectible that they are, they're a classic, fantastic gift idea that's chalked full of old school charm and tradition. This elegantly pretty duck themed KIGU brand beauty would be especially well suited to a birdwatcher or bird owner, as well as those with a passion for woodland attire. $42.00 from Chronically Vintage. 16. Poodles and Scottie dogs were two of the most iconic and beloved breeds of the mid-twentieth century and a passion for each remains strong amongst today's vintage loving crowd in particular as well. 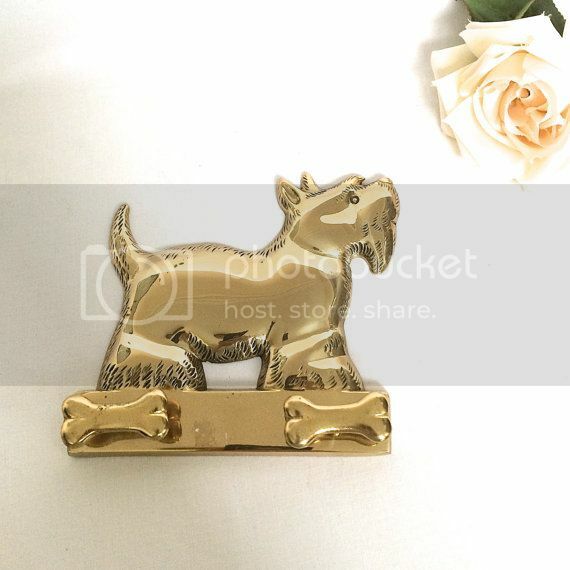 Adore your home with some classic Scottie dog cuteness with you hang up this delight little vintage brass - how fabulously fitting is this? :) - dog leash hook. $10.00 from Ella's Attic Vintage. 17. Cute as a million buttons and sooo fabulous for any kitty lover, this precious vintage inspired, old school feline print handmade dress would make for an amazing gift if you're looking to splurge on someone dear to your heart this winter. Available in modern ladies sizes XS to XLL, $145.00 from To The Byrds. 18. Ideal for those who enjoy making their own dog foods and/or who work with pups, the Sunbeam Gourmet Pets Dog Treat Maker is a handy, clever way to produce dog snacks at home that only include the sorts of things one actually wants their pet to be ingesting. $58.00 from Amazon. 19. Woodland critters are some of my favourite animals on the face of the earth and when they're rendered in adorable, holiday season perfect form like these awesome handmade felt ornaments, one can't help but adore them even more. $6.95 per felt woodland animal ornament from My Craft 2 You. 20. Equally well suited as a stocking stuffer or a sweet little present under the tree, this cuter-than-cute 1950s chenille pipe cleaner and real (likely mink) fur poodle brooch is sure to make most mid-century fashion + animal fans squeal with delight when they unwrap it. $17.50 from Chronically Vintage. 21. I'm a huge fan of cats, art, and history, as many folks are, and if you happen to have someone who adores this trio on your seasonal shopping list, then The Cat: 3500 Years of the Cat in Art by Caroline Bugler might just be an ideal holiday gift for them. $35.27 from Amazon. 22. A cuter-than-cute capybara and a guinea pig light their menorah in this uber charming, Hanukkah perfect 100% cotton fine art paper print that comes signed by the artist. $12.00 for a 5 x 7 inch print (also available in larger sizes) from When Guinea Pigs Fly. 23. Let your giftee's inner child run wild with this splendidly fun set of Dress Up Cat magnets, which - fittingly given the season - includes a Santa Claus hat and beard. $12.95 from Wireless (also available for $9.95 in an equal cool squirrel version). 24. File this one under the fun "they've thought of everything now" camp: Wet Kiss Dog Cologne, available in four different completely animal safe scents. Spritz some on your pet, and then perhaps on yourself, too, if so desired! $7.95 for each 2 ounce bottle of pet perfume from Warren London. 25. 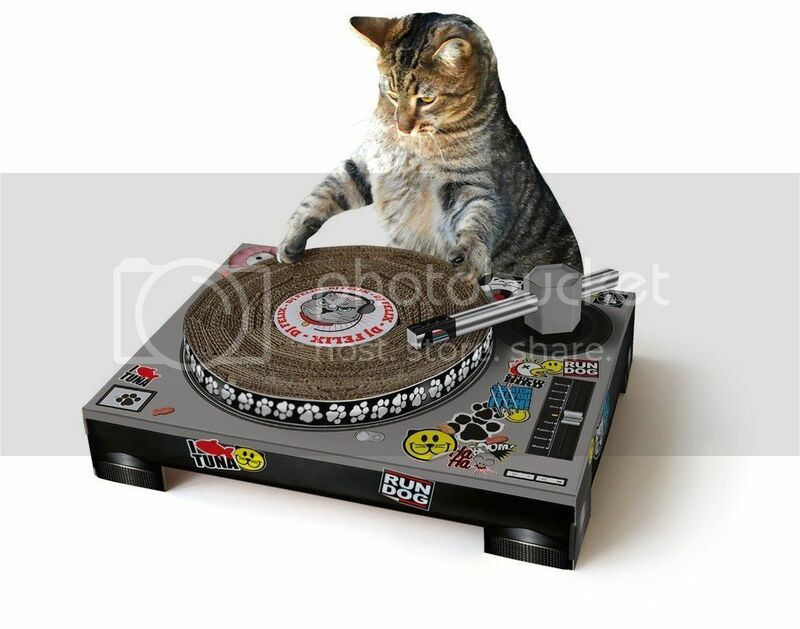 Sit back and let the social media likes roll in when you share snaps of your cat spinning tracks on this seriously cool kitty turntable scratching board. $33.39 from Amazon. Of course this is a mere fraction - a drop in the water dish, if you will - of the huge array of animal themed products and pet related items for sale on the market today, and goodness, was it hard to cap this list at just twenty entries! That I did though and I hope today’s post will help serve as a great jumping off point for you when buying for all of the critter lovers in your life. Animal themed and related gifts make for a great holiday present. They put smiles on faces, suit the cheerful spirit of the season, and are often squeal worthily adorable! Plus they're available at every possible price point, from five and dime store to uber luxury, with plenty falling in between, like those (mostly) budget-friendly options in today's post. Do you like giving and/or receiving animal related holiday gifts, too? Do you buy presents for your pets come the holiday season? (We do!) Which of the cute entries in this year's holiday gift guide appeal to you the most? Happy holiday season shopping, everyone. I hope that this furry, finned and feathered friend filled holiday gift guide helps you find the perfect present for the animal lovers in your life and/or adds some darling entries to your own festive wishlist! Yay! Your words of encouragement to include lots of puppy themed items rang in my head while putting this post together and I'm delighted to know hat you're happy with how it all came together. Seriously, isn't that wiener dog scarf darling? I love that it easily works as a gift for gals and gents alike. Thank you so much for cheering me on during the long days of putting this fun, festive post together, my sweet friend. Tons of happy holiday wishes! better i make her a salt free stew from fine poultry for x-mas! she loves it! give your stella and annie kisses from lisbeth and i!!! Thank you very for your lovely comment, sweet Beate. Wishing you and your whole household a marvelously merry holiday season! Oh my, the bunny crown, that is adorable! I know mine would shake it off then try and eat it mind you, hehe! Thank you very much. Traveling always does quite a number on me, so (best case) I'll need at least a few days to recoup, but it's a small price to pay for the chance to get away for a little while. We had a really enjoyable jaunt to Vancouver and I look forward to sharing some details of our time there in one or more future posts. Big hugs & happy holiday season wishes! Hahahaha! The shark with the laser, that made my day. Great list, Jessica. I love it! Isn't that smile inducingly awesome! I've always been a big Austin Powers fan, so the moment I spotted that cool laser pointer, I knew it had to be a quirky part of this fun holiday gift guide. What an adorable list! I have a dear friend who has guinea pigs and I may need to buy him a fleece house for one of them. Hope your furry friends are enjoying the season! Aww, I love guinea pigs soooo much! I've never had one (or more, as they do best in pairs or groups), but seriously hope to some day. I also hope your friend and her pets adore that fleece house if you give them one. We definitely are and I hope that things are going festively fabulous on your end of the country as well, my sweet friend. OH my goodness how adorable is that kitten dress????? Had to pin it to my sewing inspiration board for futre reference, because some day i am just sure that i will have to buy that dress or find some fabric close to it and make one myself. Also having family members who are head over heels about Mini Dachshunds, I am now very seriously considering the long dog scarf. These are all darling, Jessica, thanks for helping us Christmas shop! You're so welcome! The pleasure was definitely mine here, too. I'm an epicly big animal lover with two pets of my (our) own and I loved that everything I included here is something I'd want to bring into my life and home, depending on what type of pet(s) I had. Such a marvellous post! I have that knit a dog book, it is so good. I love the hamster card too and the hedgehog pen! I love buying my pets a Christmas gift! Awesome to hear! I'm not a knitter myself, but I know that if I was, I'd be investing in these utterly adorable looking books. Great to hear firsthand from someone who owns, and is happy with, it. Hello Jessica! Welcome back! I love everything on this list and I want everything! These objects could make moments more sweet and funny! I still have to do many things before Christmas, I hope to devote myself to the few gifts for loved ones! But also for my cats, even if the thing I want most of all is that they were healthy and peaceful .. The book on horses would be perfect for Julia, my cousin, she is a perfect cowgirl; on nights of the full moon with his horse go around our small mountains, I love this girl! And of course that dress with small cat it is really cute, a dream! Here is your good taste, my dear! Same here, goodness! I feel like I need a few more months worth of time before Christmas actually arrives. That isn't possible, so I'll just have to try and devote my time especially wisely in the next four weeks. First up, recoup from traveling, then Christmas cards and decorations, baking, scores of family get-togethers, gift shopping and wrapping, community events, and lots of other joys of the season. How wonderful that the horse book would suit your cousin well. I'd be elated it to add it to my bookshelf one day, too. If you get it for Julia, I hope that she adores this elegant title. Some super duper suggestions here Jessica, thank you for such a comprehensive roundup! I hope you had fun in Vancouver, look forward to hearing about it more. P.S. Thanks for the Secret Santa email, I have 90% put together my little Christmas package, after some serious Instagram stalking of my secret santee! Hi lovely lady, you're super welcome! You're beyond on the ball with getting your parcel ready for your match. Way to go! I'm so happy that you're taking part this year and hope it's an excellent experience for you on both the sending and receiving side of things. Exactly! Even when pets get into the spirit (for example, my sister's adorable dog, Beau, loves to open his own Christmas gifts), they're equally happy to be spoiled any day of the year - and doing so is such a big part of the joy of having them in our lives and homes. Many hugs & happy first week of December wishes! That is one very cooperative bunny for sure - and such a super cutie to boot. I hope that you, your family and furry friends all have a marvelous, fun filled holiday season! Lovely choices, as usual! I'm dying over that vintage compact from your shop, it's absolutely gorgeous. Isn't it a cool, eye-catching piece? I especially love vintage compacts that involve animals like this vibrant gem. They're cute + chic at the same time, always a combo that gets top marks from me. Thank you for your lovely comment. I hope that December is off to a fantastic start for you! I love that bunny crown! We're getting a load of unbreakable Chirstmas tree baubles this year, as we're sure the kittens will decide to tackle the tree at some point. That's awesome! It's such a fun, beautiful compact. We spoil our pets (and my sister's dog) during the holidays. How can you not when they're such important, beloved members of the family? Yay! I had a feeling that you and your pets would adore this post, sweet Kate. Oodles of hugs & joyful Christmas season wishes! Very clever!!! I definitely need the dachshund scarf in my life! Same here! Isn't it fantastic! So whimsical and sweet, plus you just know it's the kind of accessory that will garner scores of compliments and "Where did you get that?" questions. I dig the kitty turntable. Except, knowing my cats, that seems like the kind of purchase they'd thwart by never ever using it...and go straight to the husband's leather chair. So true, so true! :D My cat doesn't scratch cardboard (boxes, toys, etc) much, but she does love carpet and twine covered scratching posts and kitty condos. I hope that you guys have a fun filled, fantastic holiday season! I can only imagine how amazing it's going to be to experience Christmas through your child's eyes for the very first time. I wish you and your family an immensely wonderful, fun filled holiday season. Hahaha, I go for the weenie dog shawl and the knit your dog! perfect for the hub and his mum! Big hugs & happy holiday wishes! Wouldn't it though!!! Back in my single gal days, I was an aquarium owner, too, and would have been all over that adorable tree decoration as well. Tony and I would love to get an aquarium together one day, too, but so far we've either been moving too often, lived in places that didn't allow pets (thankfully no longer the case), didn't have space for a good sized one, or had other pets that weren't the best fit in said small space for one. I'm sure we'll get a tank at some point and I really look forward to it. I used to find coming home and watching my fish to be one of the most relaxing activities. How sweet that you have a tortoise! They're such cool animals. I've never had a turtle or tortoise myself, but I definitely wouldn't be opposed to it in the slightest. I agree that both of those are admittedly harder pets to shop for. It's awesome that you give your parents' dog an Advent calendar. That's really cute! :) The Advent tradition really needs to catch on more here. We have the chocolate/candy versions, but the larger act of small gifts throughout the month is not common in most families in Canada, as it is for many in Europe. I love the idea and would especially want to do it if I had children or nieces and nephews (nearby) of my own. Thank you very much for your wonderfully nice comment, dear Sanne. How fun that you got three days in Germany. I hope you had a fantastic time there. Big hugs & the very merriest of holiday season wishes!